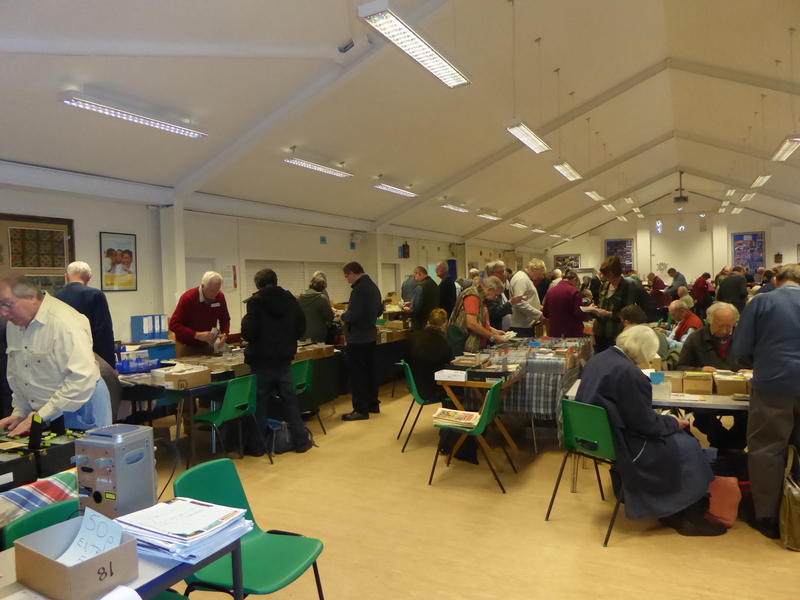 A big event in our annual calendar is the club fair held on the fourth Saturday in November at St Peter’s RC School, Horseshoe Lane East (off A246), Merrow , Guildford, Surrey GU1 2TN. Here you will find over 25 dealers offering thousands of postcards for sale on an infinite range of subjects. If you have any old cards for sale why not bring them along for a valuation. You may be surprised at what they are worth. Our venue offers excellent refreshments and free parking and is signposted from all major routes. We charge 50p for entry and make a donation to local charities. See map below. To book a table or for more information contact our organiser Tim Winter on 01428 642379. Our Annual Fair last year (2015) was hailed as a great success by collectors and dealers although numbers were down on previous years. The photograph taken on the day shows collectors searching for those elusive cards.